Stuff-a-Bag Sale this Saturday! Just in time to help the bunny fill your Easter (sewing) basket. Happy Easter weekend to all of you! Are you loving the beautiful Spring weather as much as I am? Daffodils in the garden, buds on the trees and bugs in the garage... Volkswagen Bugs, that is! I was out for a sunny morning walk with the dog when I spotted the most nostalgic, orange VW Beetle parked in an old garage just waiting for a spring drive in the sparkling sunshine. Since I started snapping photos of quilts for our shop's social media, my mind automatically pops a quilt into all sorts of interesting places. "Oh, that branch is perfectly angled to hold a quilt." or "Look at the unique texture of that fence. It should have a quilt on it." "I wonder if I could get a quilt to hang in that Moose's antlers?" and my favorite, "Honey, stop the car! I need you to hold this quilt in front of this natural wonder..." #husbandsholdingquilts is my favorite hashtag, by the way. But this time I could just see Sundee Ann Belknap with her latest great finish standing in front of this vintage car. I worked up some courage, knocked on the Bug owner's door and was thrilled when she said I could wander back to the old garage. Thankfully, Sundee Ann was also willing to join in my crazy. 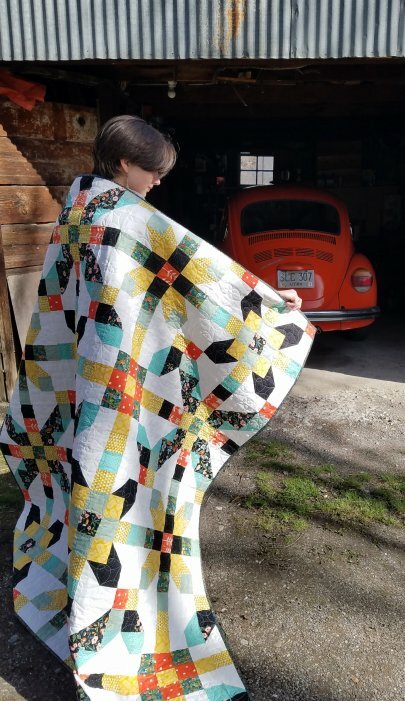 I love the unique color scheme of her City Girl quilt! That little splash of orange was begging to meet the orange bug. The creative placement of four different traditional blocks in City Girl by Orange Dot Quilts, gives this 70" x 70" quilt some modern sparkle. We have patterns, kits and Cotton + Steel yardage! 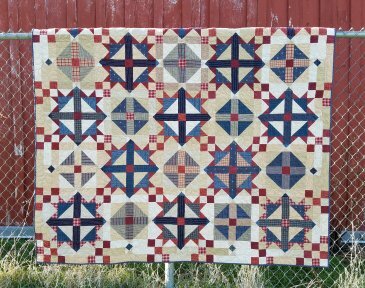 New Harmony by, Karen Wittmeyer, has lines similar to the quilt above, drawing the eye diagonally across the quilt but a more traditional color scheme and brushed woven textures give it an entirely different feel. Suzanne Adams selected classic red, blue and beige Diamond Textiles to make this 78" x 78" timeless beauty. Kits available! For more class info and project photos click here. Saturday, March 31st is a 5th Saturday. 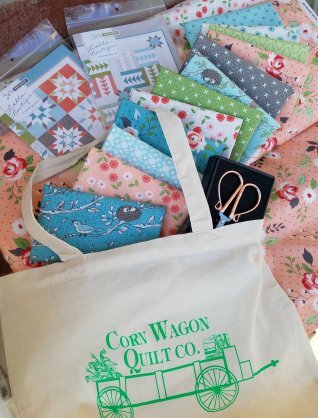 Just in time for the Easter Bunny to fill your <sewing> basket - - it's time to bring in your reusable cotton Corn Wagon bag and receive 25% off any regular price items you can stuff inside! If you don't have a bag yet, you can purchase one for $5 and reuse it every 5th Saturday for the same great sale. I stuffed this bag with the darling new Nest collection from Lella Boutique of Moda Fabrics. It's here! We have yardage, precuts and patterns on the shelf. We have soooooo many new arrivals this week (we've kept the deliveryman busy)! April 2nd - 25% off MINKY! This sale includes regular price 60" & 90" Cuddle and minky style fabric & kits!